Amazingly - given their popularity in Australian cuisine - I've never bought little red radishes before. I've always been more of a daikon kind of girl. But when I saw bunches of radishes going for cheap, cheap, cheap at the market the other week, I thought it was high time I experimented with them. spring onion and baby radishes. 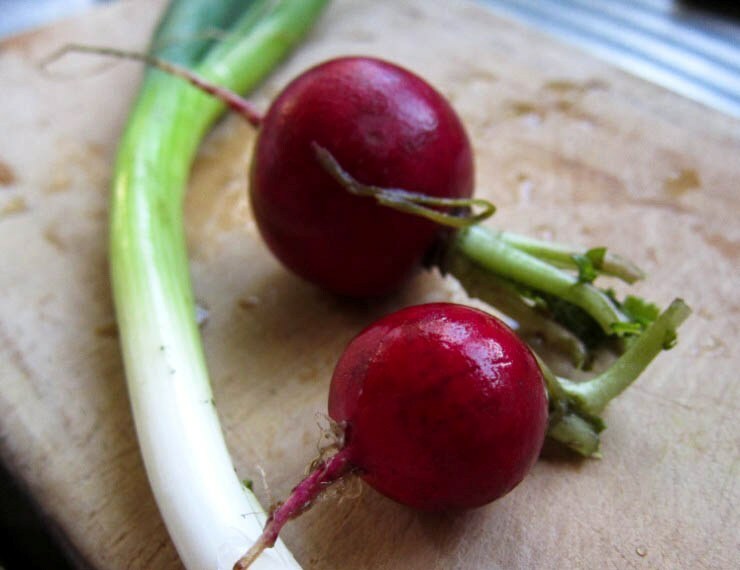 Radishes, when raw, have a sharp, spicy flavour which mellows down to a gentle sweetness if cooked. For this recipe, you may use either raw radish, cooked radish, or a combination of both, depending on your preferences. If you serve this salad soon after preparation, the difference will be fairly distinct in both taste and texture, but if you leave the radish slices to marinade overnight, the dressing so infuses them that it becomes much of a muchness - in which case, just leave 'em raw and save yourself the trouble. This incredibly easy recipe is really just a combination of sliced radishes and spring onions tossed in a vinaigrette of shoyu, lemon and roasted sesame oil. Very simple. Very refreshing. Trim the leaves and ends of the radishes. Thinly slice. Leave them raw, or if you prefer, you may boil or steam them till just tender. Finely slice the dark green part of the spring onions. Don't discard the white parts, though - you can use them in future soups, stocks and stir-fries. Alternatively, you can also boil or steam the white parts to take away their edge, and use them in this salad as well. Toss together radish and spring onions with soy sauce, lemon or lime juice, and sesame oil, making sure they mix well. Let the salad marinade serenely in the fridge for at least 30 minutes, or leave it overnight before serving. Makes a great little side dish! To make this recipe gluten-free, use wheat-free tamari soy sauce. Use less of the lemon or lime juice if you prefer a less acidic taste. If you have sesame seeds (I wish I did! ), lightly toast and sprinkle through the salad just before serving, for extra flavour and crunch. asian-inspired spring onion & radish salad in shoyu-lemon-sesame vinaigrette. We're growing black radishes this year! They're only black on the outside, but I'm thrilled by them. Black radishes... interesting! I just did a quick search, they almost have a gothic quality to them. I love radishes! might have to grow some. I have a soft spot for radishes, i must try them with your shoyu-lemon-sesame vinaigrette. This sounds so awesomely simple. I love radishes, they're not very cheap here though unfortunately. They're delicious roasted, but there's nothing like their sharp pepperiness when raw! I'll have to roast them next time! Especially seeing it's winter here now. I keep trying to grow radishes and the slugs keep eating them! Once I work out a natural way to keep them away I will definitely make this salad as I think this recipe deserves home grown radishes :) Failing that- Ill go to the farmers markets! Oh golly, I've never cooked or marinated radishes, never even thought of it! 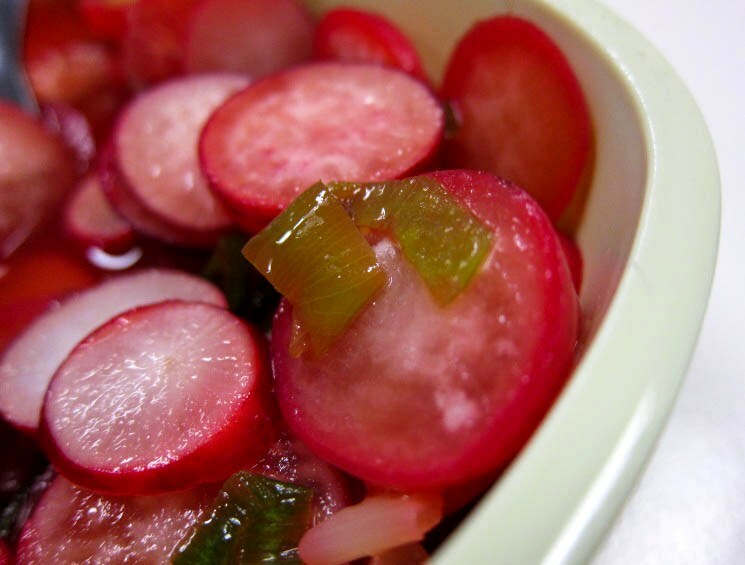 I love the intense spiciness of raw radishes, but this looks so good. I like them totally raw too! I think this salad will be just as good - in a different way - if you have it soon after making, with minimal standing time. I seldom use radishes at home too. They are so nice to just munch on. Oh, I agree - it's almost like munching on a little savoury apple! I tried a similar version recently - thin shavings of radishes and tomatoes tossed in sesame-ginger dressing and really enjoyed it! The radishes you have look so bright and fresh. Sometimes the best ideas are the simplest. Love the combination of radish and onion here and your vinaigrette is to die for! Hey Leaf, I nominated you for an award on my blog - I have sent you and email too! I love radishes! I like to use my mandoline to slice them very finely, then combine them with snow pea pods and a sesame oil and lemon dressing... sounds similar to what you've made here! Love fast fresh food like this! Love the simplicity of this dish, leaf :). I'm actually more accustomed to Western style salads since we didn't really eat salads as such in our household but we've been eating more of the Vietnamese-style salads lately so this might be good to change things up :). Thanks Ames! Salad wasn't big in my household either, growing up I usually found my vegetables in soups, stews, stir-fries, curries, etc. But I've gotten into salads in recent years. The humble radish is often over-looked in my kitchen. Thanks for reminding me of its loveliness. Great opening shot, too. Thanks for sharing your ways with radishes! The vase idea is novel to me - and I can imagine how beautiful they would look. I've never had cooked radish before! I can't wait to try them!